No hospital is quite complete without a crew or staff that really cares about the maintenance, performance, and functionality of the hospital itself. 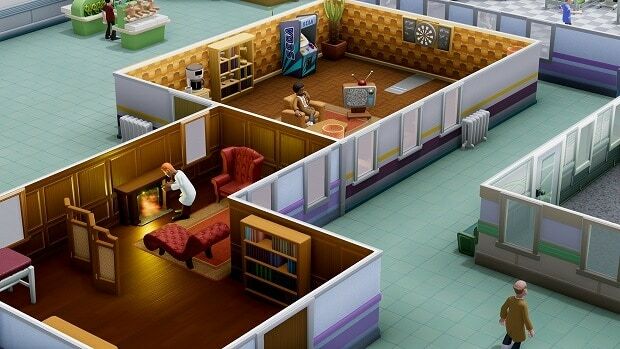 Thanks to the simulator nature of the game, there’s some depth to the staff management system, so our Two Point Hospital Staff Guide will shed some light on it. There are a total of five categories or traits that can be assigned to a staff member i.e. Doctors, Nurses, Assistants, Janitors, and Teachers. They, together with the Manager, serve as the foundation of the core principles due to which the hospital exists and thrives. First, try to hire new staff from the Hire menu. Here you can see a star rating next to each potential crewmember. This gives an idea of how valuable a member would be to your team. The higher the number of stars the more skilled/qualified the staff member is going to be. However, this also comes at the cost of higher salary required by that individual. Staff can be trained by using the Start Training feature which will allow you to have your staff learn new skills or improve existing ones. A higher-level staff member will have more slots of skills to choose from. Each staff member should be given a proper space, that’s why an office should be set up to facilitate that. Apart from the professional space, there should also be enough social rooms to help the staff with their morale and stamina. The former is based around the needs of the staff i.e. toilet, thirst, hunger, and salary. If it’s too low, you risk losing the staff member. Secondly, the stamina, if not replenished thanks to the social rooms, will mean the staff will remain inactive. This can create long queues and other messy stuff. Have social rooms at all costs. Lastly, to keep things simple and most effective, you should ensure that your staff members aren’t multitasking or aren’t assigned to work in multiple areas. This is risky and may lead to some areas under-performing because of the skill requirement. To eliminate this risk, go the Job Assignment tab and remove any other assignments for each staff worker so they don’t switch up places or assignments. Now let’s get into the five categories of the staff members themselves. These come in three specializations or sub categories i.e. GPs, Treatment, and Research. Each of these carry their own traits and are suitable to specific areas where they work best. GPs focus on diagnostics and so they can equip the trait of +10% Diagnostic skill improvement. They shouldn’t be your top priority! Next up, you have the Treatment doctors who mainly affect and control the death rate of patients. For that reason, these should be your top priority. Upgrade and train them for skills whenever possible and keep their morale high. Give them prestigious rooms to bump up the happiness, as this will add to their skill; a whole 10%. Keep them well fed, give them breaks often, have energy drinks lined up, your goal is to keep them happy and both mentally and physically alert. Research sector, again, a low priority because no improvements or advantages occur depending on the happiness level of the staff working here. You just continue to bring them the sufficient equipment, no need to set up fancy rooms just for them. Again two categories i.e. GPs and Treatment. The former is a lower priority because they only take part in diagnostics and general tasks. The latter is where you should invest when it comes to skill. The treatment nurses will cure patients, help with doctors on operations, and even work instead of doctors sometimes. You can train them to get an additional 50% learning and teaching trait allotted to them. Moreover, the treatment skill has a trait which allows 10% increase in the treatment skill. These handle the traffic, the queue of patients. Rank them up because they’ll be able to handle the patients faster so to rule out any inconveniences. Make them happy and you’ve got yourself some workers who are super-fast at serving the customers. The traits that can be worked on include 50% buff on Customer Service skill and lower stamina consumption so longer shifts can be taken by the same assistant. This allows you to have as few receptionists as possible. Lastly, they will also help you out in marketing when you reach that task. These take care of everything from the toilets to getting rids of Ghosts, Monobeasts, and almost any other problem. Speed is key here, so thanks to the Maintenance and Motivation trait trees, you can have Janitors who have their speed attribute go up by 40%. You can also keep high caffeine drinks in the staff room to ensure they’re always read to move to where they’re needed. This works as an alternative to hiring guest trainers which are quite expensive. With this method, you can choose a staff member and make them learn the skill of teaching so to benefit future doctors in their training at no cost. Moreover, the teaching masterclass skill can also be learned for a 50% buff to the teaching skill itself. Post some educational charts and info-graphs in the classrooms and staff areas for even more buffs for teaching. 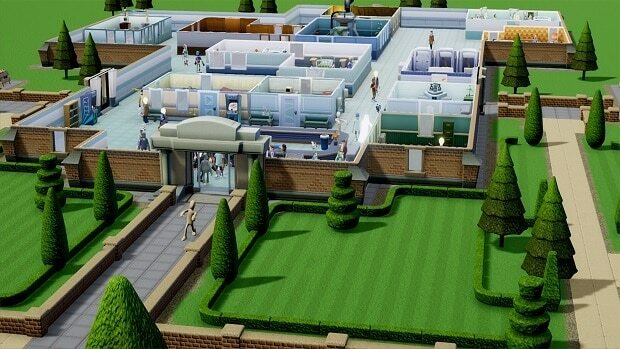 That’s it folks, all the Two Point Hospital Staff explained. 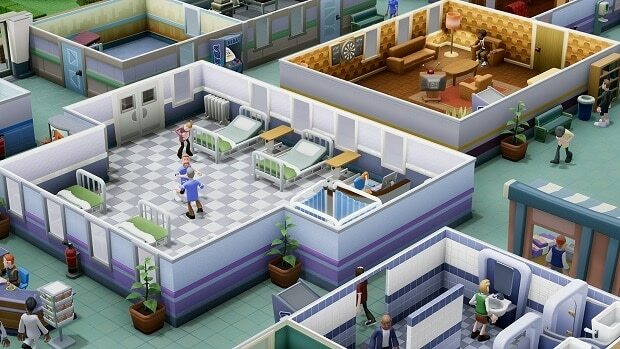 Now doodly do, see how you manage your hospital with these tips. If we’re missing out on anything, let us know down below!